There are several definitions of “mobile learning” in the scientific literature based on either the technological characteristics or didactic opportunities of the given devices. The first entities to look into mobile learning in the early 2000s were the MoLE Project, GoLearn, MoLeNET, BLOOM, Pockets of Potential, and Project K-Nect (ADL, n.d.). The Mobile Learning Project (MoLE Project) was a two-year multinational technology research project sponsored by the U.S military to facilitate the sharing of knowledge and resources between partners including first responders, medical professionals, and public health personnel responding to a humanitarian crisis or natural disaster. The Mobile Learning Network (MoLeNet) was a unique collaborative approach to introducing and supporting mobile learning in education and training via shared-cost mobile learning projects during the time period 2007-2010 (Parker, 2010). As part of MoLeNet, a process of using portable, wireless, and accessible mobile devices was meant to optimize and support mobile learning and training, which would enable an individual to learn, create or receive information more effectively. As a result of all this research, mobile learning was able to become a new mode of study that’s notably different from traditional learning. Mobile learning technologies transform the process of learning and make the active participation of a learner in one’s own education a real possibility. As an educational process that is separate and distinct from other distance or blended learning formats, mobile learning is more informal and individualized. Scientists M.S. Donovan and J.D. Bransford (authors of How Students Learn) in their research make a distinction between two types of digital learning: mobile and е-learning. They note that mobile learning is different than e-learning with computers due to time and space accessibility, providing continuous access to teaching material, which makes it so that the learner gets an understanding of education as a continuous process of life-long education. According to Terry Heick at TeachThought, “mobile learning is learning based on mobility often through mobile devices like smartphones, iPads, other tablets, and wearable technology” (Heick, 2018). 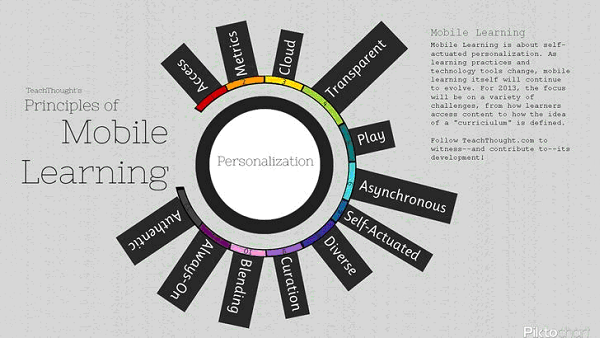 Years ago, Heick created a graphic (see above) that laid out some of the principles of mobile learning, which included Access, Always-on, Curation, Play, Self-Actuation, and Metrics. Mobile phones aren’t called smartphones for nothing. Modern smartphones are basically handheld personal computers with extensive computing capabilities, including high-speed access to the Internet using both Wi-Fi and broadband. Most, if not all, smartphones also support Bluetooth and satellite navigation. They have a touchscreen color display with a graphical user interface that and enables the user to use a virtual keyboard to type and press onscreen icons. The writing of electronic textbooks, subject testing programs, and training manuals for mobile phones is going in a promising direction for successful implementation. The first (and most common) way to use a mobile phone when applied as one of the distance learning forms is as a means of accessing the Internet for websites with teaching information. It is possible to organize access to specialized sites containing electronic training courses, tests, practical assignments, and additional training materials (drawings, photographs, audio and video files). It is also possible to exchange e-mail for educational purposes and instant messaging, versions of which exist for mobile phones. The second way to use mobile phones for learning is to use special programs for cell phone platforms that are able to open and view office software files, such as Office Word, PowerPoint, and Excel. Thus, having such files in the memory of a mobile phone, you can view their versions adapted specifically for the phone screen with convenient scroll bars, a suitable font and a user-friendly interface. Thirdly, a mobile phone is a means of reproducing audio, text, video and graphics files containing educational information, for which there are program players in each phone in recent years. Especially valuable is this opportunity is for those wishing to learn foreign languages ​​- there is a huge variety of audio courses and audiobooks, including files of different formats and lengths. Another way to use mobile phones for learning is to use electronic textbooks, specialized courses, and training manuals adapted for viewing on students’ mobile phones or developed directly for mobile phone platforms. Students are encouraged to download Java applications to their phone, containing, for example, lecture texts or subject testing programs. The ability to place schemes, drawings and formulas make writing electronic training manuals for mobile phones applicable to absolutely any subject under study. There are a lot of special applications for mobile phones, such as calculators of varying degrees of complexity (simple, scientific), office programs, graphics programs, applications containing various tests with answers, etc. Thus, at all stages of training, from preschoolers to professionals, there are many opportunities for the transfer of information materials to the trainee, as well as monitoring the entire learning process and assisting in solving problems. Writing is the thing Melisa Marzett lives for. Currently working for Great online class takers, she devotes all her energies to writing. She has accomplished many posts by now and topics vary as she is always up for a chance to write a guest article. As such, her diversity and flexibility are worthy of great praise.